The village of Ta Pae Yoi is one of three villages located on the island of Koh Phra Thong and the latest to develop a community based tourism group. The main livelihood of the villagers is fishing and locals rely on the nature surrounding the village to support their simple and relaxed way of life. This village is located on the north eastern side of Koh Phra Thong and situated facing the mainland, sparing it from the most devastating destruction of the 2004 tsunami that impacted the other villages on this island. The village hosts a school, health center, local government office and also a temple. Ta Pae Yoi is easily accessible by daily passenger boat service. 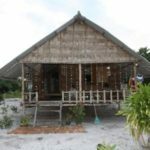 The village itself is set up for homestays that can accommodate single travelers and study groups, with many cultural and ecotourism activities available around the area. Take a tractor tour to the Savannah. Explore the uninhabited interior of the island. Visit the stretch of undeveloped beach.